While the kiddos have gone back to school and the stores have already begun their holiday takeover with all things Halloween and Thanksgiving, it is still very much Summer around here. In fact, as long as my car feels like the surface of the sun when I get into it, it’s officially still smoothie weather! So put. down. the. pumpkin. 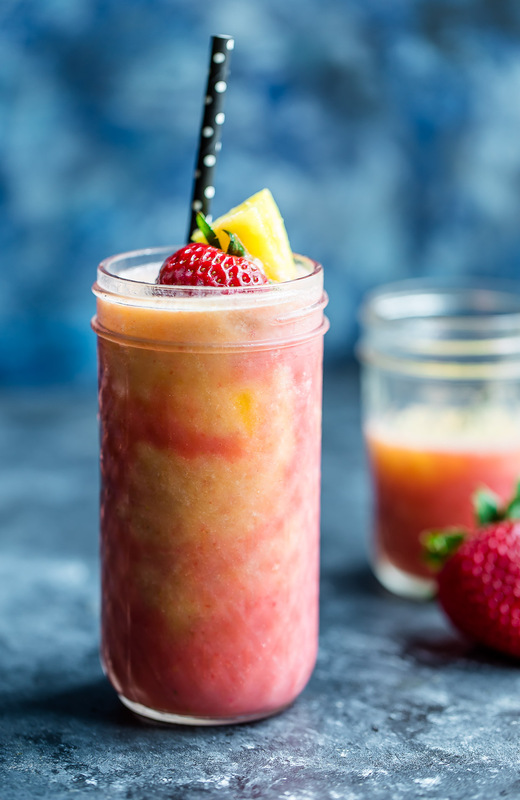 For us Floridians, it’s smoothie weather pretty much year round! So back away from the pumpkin spice and raid your freezer for some icy sweet fruit. We have smoothies to make, yo! Though I typically spike my smoothies with veggies (everything from kale to beets to spinach to carrots) I like to have a little fruity goodness up my sleeve as well. This one tastes like a fancy mocktail with it’s tasty tropical vibe! 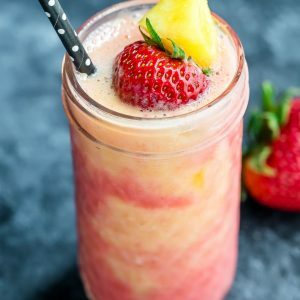 This sassy swirled smoothie is spiked with pineapple, strawberry, and coconut flavors with a light kiss of vanilla and honey to sweeten the deal! Recipe adapted from Jocelyn at Grandbaby Cakes. looking for more scrumptious smoothies? Tropical Mango Kale Smoothie – KALE YEAH! 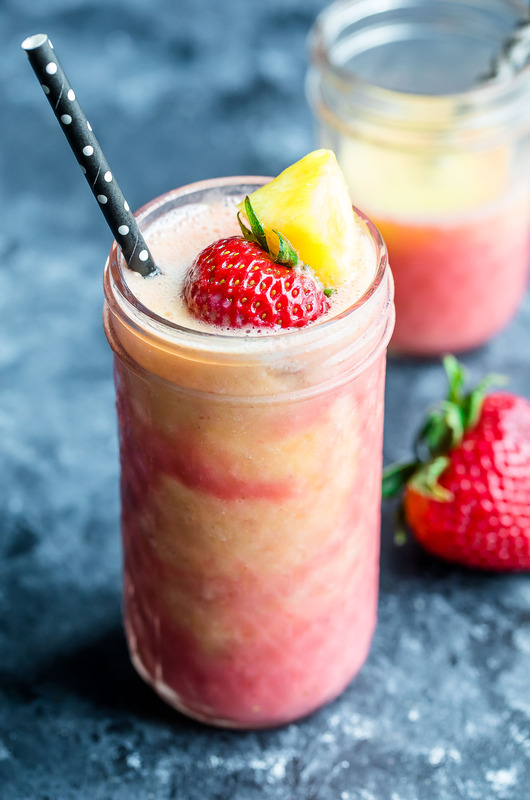 If you get a chance to try this tasty Tropical Pineapple Strawberry Swirl Smoothie, let me know! Leave some love in the comment form below or tag your photos with @peasandcrayons on Instagram so I can happy dance over your creation! 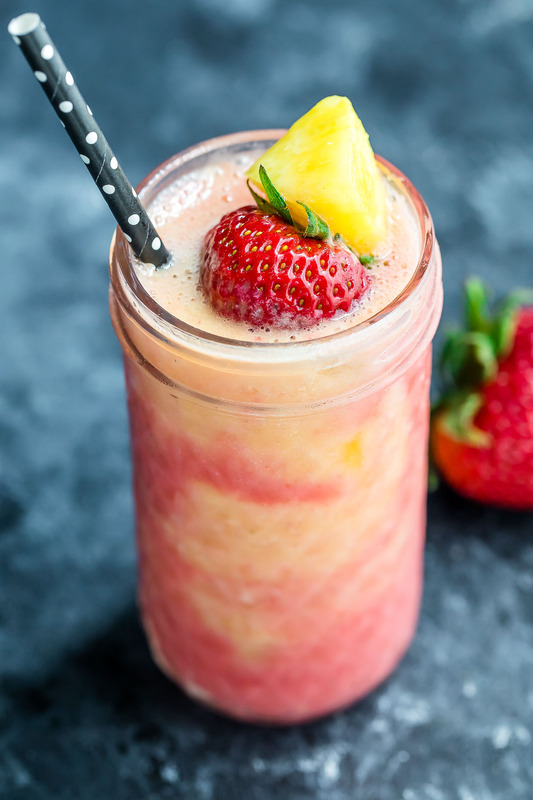 Smoothies are my go-to snack or breakfast, and I LOVE this one! This is my kind of refresher. I love how the colors are swirled together, and I adore that little bit of coconut flavor. This is a complete winner in my book! Please let us know the calorie content: thank you. Hi Phyllis! I’m having trouble logging into my Myfitnesspal account right now but you’ll just want to calculate it there with their free tool with which yogurt you choose to use. For lower calorie I’d use a non-fat yogurt!